Blind Guardian, a name that redefined a genre and made it their own. A name that continues to have legendary and mystical qualities attached to it by encapsulating, engrossing and breeding loyalty from a tremendous cross section of fans from all genres. In 2015, Blind Guardian returns to Australia, for what may be their final time, for two exclusive shows that are sure to sell out in both Melbourne and Sydney. Bringing their charismatic and enthralling stage show to Australia, Blind Guardian deliver live performances that are nothing short of breathtaking. Blind Guardian will perform tracks off their brilliant and recent release Beyond the Red Mirror as well as a comprehensive selection of fan favourite tracks. 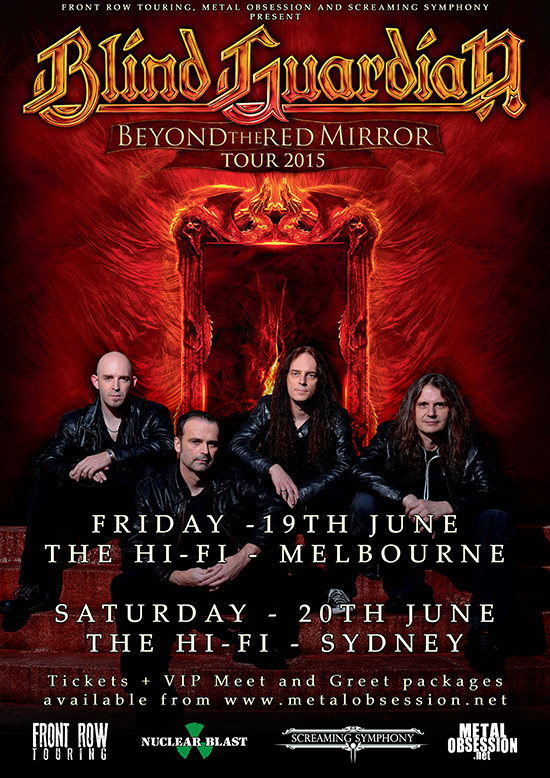 Blind Guardian will only be staging two shows; one in Melbourne at the Hi-Fi and one in Sydney at the Hi-Fi. There will be on offer a strictly limited VIP meet and greet pass available for only 25 people per show. The VIP Meet & Greet fan pass is available from Metal Obsession. Do not miss out on this tour as it has all the hallmarks of selling out fast and you may just miss seeing this stunning act for the very last time on Australian shores.